The life of a Stormtrooper is rough. Back in the early days of the Republic, enlistment itself was quite a bother. You first had to be a direct clone of Jango. That pretty much eliminated any chance for most of us from joining up. Those lucky enough to be completely identical right down to DNA then had to endure years of tough training on Kamino. And, even after all that, let’s just say that the aiming of blasters was… problematic. We thought it was the genetics, so we opened it up to anyone capable of finishing the training and donning the iconic gear… but same problem. Oh, we laughed for several hours when we realized that it was the mask that was the problem! Optics were completely misaligned. So many clones all dead because of that silly mistake. Whoops! So, now we have almost no Stormtroopers available and a completely repaired optical system. Good news for you, Stormtrooper, because you’re enlisted! 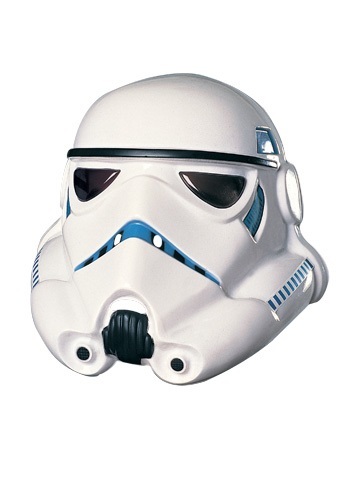 Grab your officially licensed half mask molded PVC Stormtrooper Mask and get ready to go head to head with an unknown number rebels. It’s that easy! Don’t worry. We’re sure that your aim is going to be better than before. It basically can’t not be!